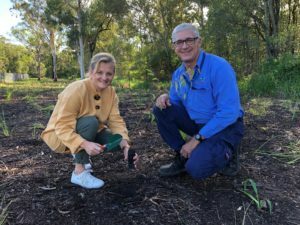 Redland City Council this week achieved an important milestone, reaching the 250,000 mark in an initiative to plant one million native plants across Redlands Coast by 2026. Redland City Mayor Karen Williams said the achievement, reached at Smith Street, Capalaba, was part of an ongoing planting program to enhance existing, and create new, wildlife corridors for koalas and other native species. “The One Million Native Plants initiative is part of Council’s commitment to a greener Redlands Coast, and reaching this milestone is something to be celebrated by all of Council, our army of invaluable volunteers and the wider Redlands Coast community,” Cr Williams said. “These 250,000 plants will provide shelter for our wildlife, help reduce erosion along local waterways and provide a greener city for residents to enjoy. “The One Million Native Plants initiative continues our strong commitment over many years, which has resulted in Redlands Coast having 7232 ha of conservation land and 40 per cent of its total land area protected green spaces. Cr Williams said while the larger plantings had been undertaken by Council’s Parks and Conservation area, Redlands Coast’s strong volunteer base had also helped put many plants in the ground. “We have a dedicated group of local volunteers who, along with our own Parks and Conservation and Environmental Management teams, need to take a great deal of the credit for this achievement,” Cr Williams said. Divisional Councillor for Ormiston Tracey Huges said she hoped community volunteers would turn out in force on Sunday 7 April, have fun in the great outdoors and help the One Million Native Plants tally continue to grow. “Hilliards Creek is an important wildlife corridor, and is part of Council’s first trial koala neighbourhood precinct – the Ormiston Koala Conservation Safe Neighbourhood,” Cr Huges said. “Aside from the important contribution people will be making to their local ecosystem, the day will be a chance to connect with the naturally wonderful Redlands Coast and meet with our environmental officers. We supply: Plants, tools, sunscreen, insect repellent and gardening gloves. The count started on 1 July 2016, the first full financial year after the March 2016 election. Only plants that Redland City Council installs are counted (Operations and Maintenance, Indigiscapes, Bushcare). The project is now two years and nine months into a ten-year program to deliver the One Million Native Plants, with 247,894 plants installed in the lead-up to this month’s planting in Smith Street, Capalaba. The Smith Street planting commenced on Wednesday 27 March and will take the tally to 261,594.
individual trees (for example, street and parkland trees), plantings of a few hundred or thousand plants through community plantings and Bushcare and Parks and Conservation large plantings (up to 19,000 plants in a single planting) as part of Council’s operational program. Mayor Karen Williams with Council Conservation Support Officer Dominic Newland. Posted in Community, Environment, Uncategorized and tagged .